An ultrasound is performed at the first obstetric (OB) appointment to confirm a pregnancy and identify the weeks of gestation. Obstetricians may order an ultrasound test to determine the growth, fetal heart rate, and umbilical artery flow (Doppler) if they are concerned with the fetus during a pregnancy. A complete ultrasound is an in-depth ultrasound done at 20 weeks of gestation to look at the health and wellbeing of a baby. The ultrasound technician looks at virtually everything about your baby from head to toe! Those choosing an ultrasound will be asked to drink a lot of water beginning 2 weeks prior to the appointment. The increased water provides a clearer view and better pictures of your baby. You may also want a gender check ultrasound that can be performed as early as 16 weeks to try to determine the gender of the baby. These three types of ultrasounds do not require an order from the obstetrician but an appointment must be scheduled in advance. It is important to know that gender check ultrasounds are not covered by insurance but our in-house ultrasound services are very reasonably priced. 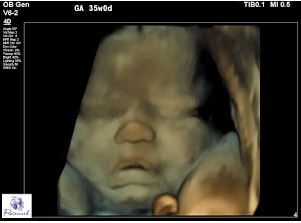 We also offer an optional 3D/4D ultrasound beginning at about 32 weeks. Like gender check ultrasounds, a physician order is not necessary but it is an excellent experience for the whole family. Our 3D/4D ultrasounds deliver high-definition (HDTV) projection of high-resolution images with the area’s most technologically advanced ultrasound equipment. With our ultrasound system, we are able to display on-screen 3D/4D images and seamlessly toggle between 2D, 3D, and 4D imagery. We capture crisp, high-resolution images for even the most challenging scans that make wonderful keepsakes. If you have family or friends that live far away, no problem! They can also join the excitement of the ultrasound with the latest technology! With our state-of-the-art cloud technology, we are able to provide you with a link that allows you to share your photos with your smart phone.